Hearty trees with leaves that fall or change color in autumn are common on the Arkansas landscape. Many Arkansas trees also provide significant shade and feature fruits that are edible for both humans and local wildlife. Arkansas trees vary in size, from very large, stately plants to small, shrub-like trees; the leaves of these plants differ in size, as well. 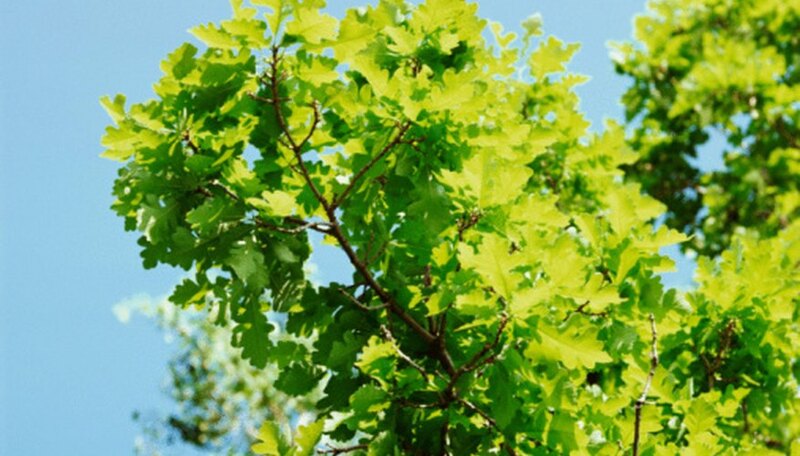 The sugar maple, an ornamental landscape tree with a 50-foot spread, can grow up to 75 feet tall and has broad green leaves that change to a reddish brown in the summer and grow to around 5 inches in length. The deciduous holly, or winterberry tree, is a perennial plant that is significantly smaller--about 15 feet, with leaves that are about an inch across. The colors of Arkansas trees and leaves are numerous, as well. The silver maple tree, a native Arkansas plant, has hunter green leaves that are silver underneath, and deep brown bark. The sassafras tree, which is known for its fragrance and grayish-brown trunk and branches, has leaves that are bright green in the summer but turn orange, red and even purple in the fall. Various trees grow in different parts of the state of Arkansas, due to differing weather and soil conditions. For instance, the pecan tree, with leaves that grow up to 20 inches,grows best in USDA Zone 6, which includes the northwestern tip of Arkansas. The persimmon tree, which has broad green leaves and a height of about 50 feet, and grow in southern region of Arkansas, or, zones 7, 8, 9 or 10.